Maintenance items, which should be serviced at the same time that you replace the engine oil, appear on the driver information interface. You can view them on the Maintenance Minder screen at any time. Turn the ignition switch to ON *1. Press the button several times until is displayed. Press ENTER to go to the Maintenance Minder screen. The engine oil life appears on the driver information interface along with maintenance items due soon. 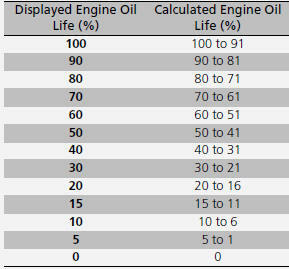 Based on the engine operating conditions and oil age, the remaining engine oil life is calculated and displayed as a percentage. There is a list of maintenance main and sub items you can view on the driver information interface.